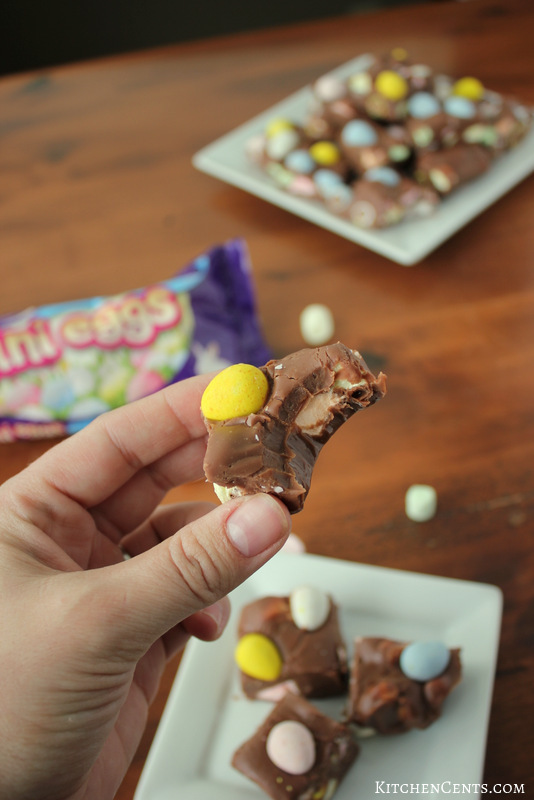 4-ingredient Easter Fudge – rich chocolate fudge filled with colorful mini marshmallows and Cadbury Mini Eggs. An easy Easter treat that only takes 5 minutes to make! This easy chocolate fudge is a fun, festive treat everyone will love. Its rich chocolate-y fudge is filled with soft marshmallows and candy-coated mini chocolate eggs. It’s a scrumptious way to welcome Spring and only takes 4 ingredients and 5 minutes to make (minus chilling time, of course). 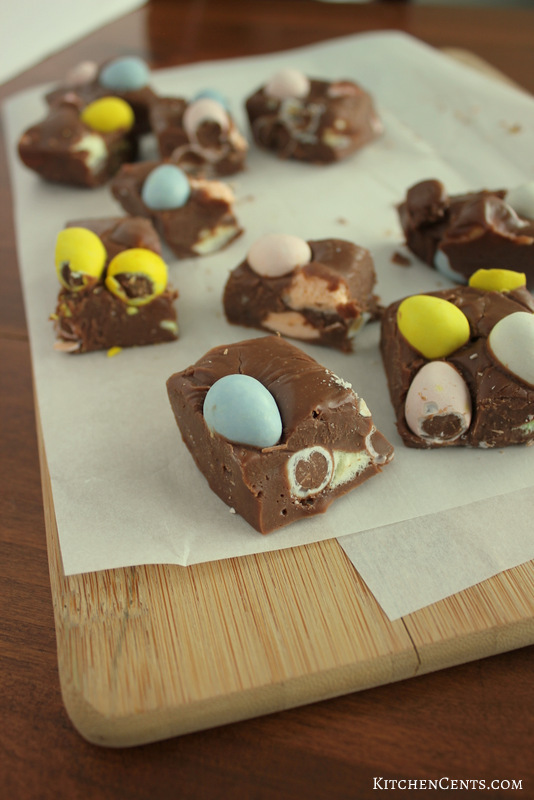 This easy Easter fudge is so quick and easy. It’s an “eggs”ellent spring treat! Guys… I just had to say it, as cheesy as it was. The opportunity was there. Haha. 5 minutes is all it takes to make a batch of this yummy fudge then you let it chill in the fridge to set. 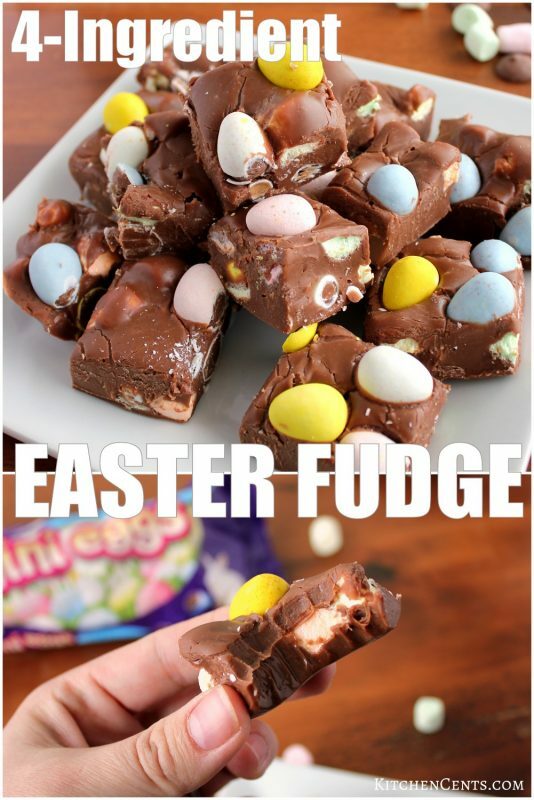 You can find the full printable recipe for this awesome EASTER FUDGE HERE or by clicking any of the large buttons below. 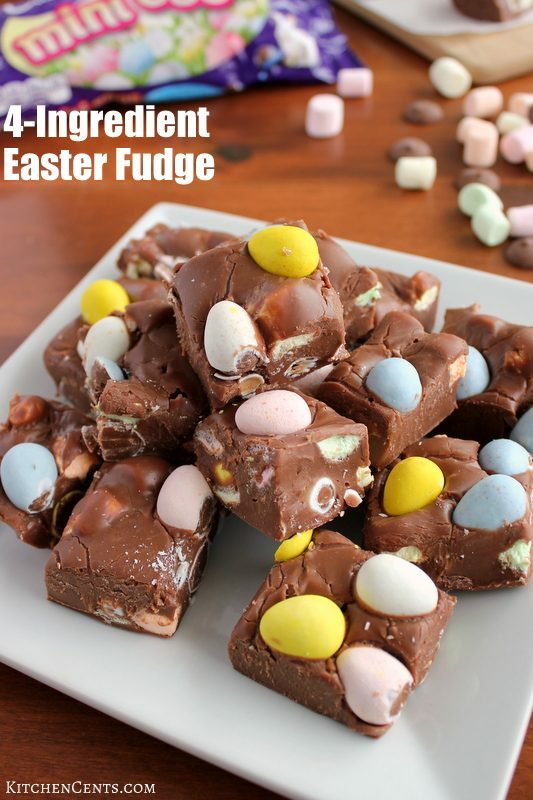 This Easter fudge is a great treat to make when you need a quick fix. It whips up in about 5 minutes and can set within 20-30 minutes if placed in the freezer instead of the fridge. 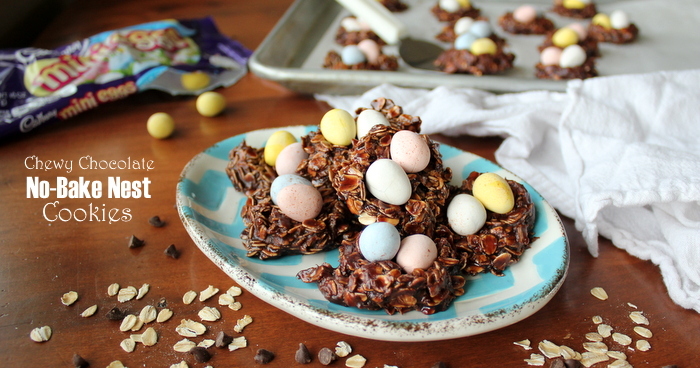 It’s a chocolate lover’s Easter dream and a fun recipe to make with the kids. What else do you need to have an awesome Easter treat? This fudge is so easy! This is how to make it. In a microwave safe bowl (I love using my pyrex glass bowls for this), pour the chocolate chips in the bottom then pour the sweetened condensed milk over the top. Pop the chocolate milk mixture into the microwave for 2 1/2 to 3 minutes until the mixture is hot and the chocolate began melt. Stir the chocolate milk mixture until the chocolate chips are completely melted. The chocolate should be smooth. Next, add the vanilla if you’d like. This ingredient is optional. I think the vanilla gives this fudge a warm homemade flavor. Once the vanilla is mixed in, add the marshmallows. I used the multicolored marshmallows to give this Easter fudge a few more pops of pastel color. My kids loved that! If you prefer the plain white marshmallows, you can use them instead or omit altogether. 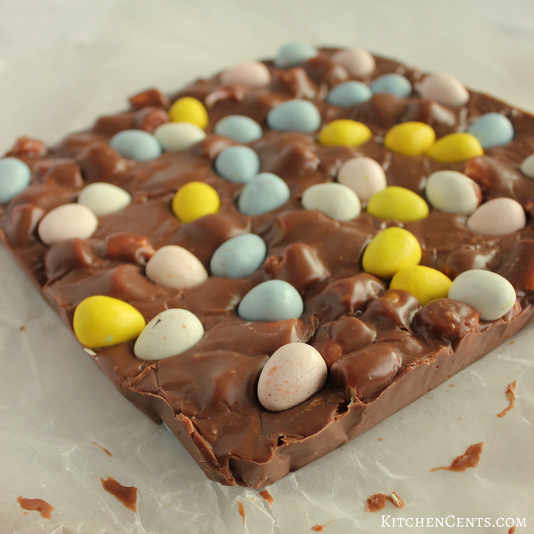 Line an 8×8-inch pan with waxed paper (you could also use parchment paper) then poured about half the mini chocolate eggs in the bottom. Next, pour the fudge into the pan and spread evenly until it’s smooth. 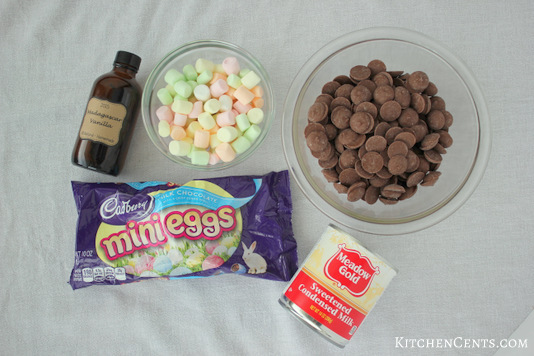 Then top the fudge with the remaining mini chocolate eggs. So simple, right? Once it’s complete, pop it into the fridge to chill out. It took about 45 minutes to set. If you’re in a hurry, you could try sliding the warm fudge into the freezer for 20-30 minutes to speed up the cooling process. This is what mine looked like after it had cooled and I unwrapped it. Doesn’t it look yummy? HOW DO I CUT THIS FUDGE AND HOW MANY PIECES DOES IT MAKE? For easier cutting, use a long sharp knife. One that will span the entire fudge. To get a smooth cut, clean or wipe the knife after each use. 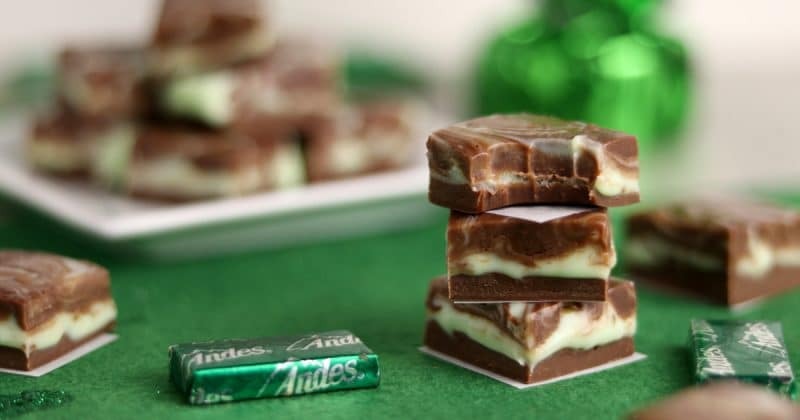 Cut the Easter fudge into long strips then into squares. My husband, who is very analytical and a little critical, teased me for my uneven cutting. I just told him there were some regular-sized pieces, diet-sized pieces, and super-sized pieces. Haha! Once cut we enjoyed them… ALL! Soooo delicious! We ate almost all this batch ourselves but if you like to share, this is a great Easter treat to share with friends and neighbors or add to a chocolate Easter treat platter. If you have a little more self-control than we did, you can store this fudge in an airtight container on the counter or in the fridge. That’s it my friends. If you’re a fudge lover, chocolate lover, or Cadbury lover for that matter, this Easter fudge is a great recipe to have in your recipe box. It’s quick, easy and tastes so yummy! I guess I will have to start my diet after Easter! So much goodness in one amazing recipe! Thank you. If I leave out the candies. Do you think that it is possible to make these into molds, so I can have it be in cute shapes for a bridal shower? Hi Jenny! Thanks for stopping by. I’ve never molded this recipe but in theory, I think it would work. The only thing I would suggest is to make sure your molds are well coated with something (oil, rice crispies, or even sugar). I think the biggest problem you might run into is that fudge is soft in nature and soft things don’t like to pop out of molds easily. If you decide to mold this fudge I would love to hear about your experience! Hi Kyooty! I’m sorry you’ve had a bad experience with this. I’m not sure if you are referring to the Easy 4-ingredient Easter Fudge recipe. The fudge recipe doesn’t have any white chocolate in it. Also, did you use milk as in cow’s milk? This recipe calls for a 14-oz can of sweetened condensed milk. It’s very thick and sweet. If you used regular milk that would probably explain why it was goo.